"The World Commission on Environment and Development, headed by Gro Harlem Brundtland, Prime Minister of Norway, was set up as an independent body in 1983 by the United Nations. 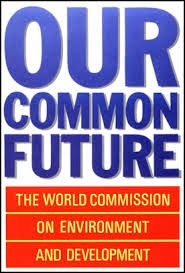 Its brief was to re-examine the critical environment and development problems on the planet and to formulate realistic proposals to solve them, and to ensure that human progress will be sustained through development without bankrupting the resources of future generations"
We know this report played a key role in the creation of Agenda 21, from references to it, in various Agenda 21 affiliated literature. For example, in the Introduction section of the children's version of Agenda 21, Rescue Mission: Planet Earth, the Brundtland Report, Our Common Future, is credited with "set[ting] out the idea of Sustainable Development." Of course the term 'sustainable development' is key, as nearly every chapter of the Agenda 21 Program revolves around the idea of creating, what they refer to as, "a new global partnership for sustainable development." Another example to show this report's connection to Agenda 21 comes from a newsletter released by a highly-influential organization in the area of regional planning, the American Planning Association (APA). In an article titled, How Sustainable Is Our Planning?, land use planner Robert Odland, discusses the origins of the term 'sustainable development', how it is being used more frequently by planners, and it's connection to Agenda 21. "[A] new family of terms is appearing more frequently in planning : sustainable development, sustainable cities, and sustainable growth. What do these terms mean and what are the implications for planners? The concept of sustainability and sustainable development came into the public debate with the publication of the World Commission on Environment and Development report, Our Common Future, (often known as the Brundtland Report). This report defined sustainable development as the ability to meet the needs of the current population without compromising the ability of future generations to meet their own needs." Providing a full, detailed analysis of Our Common Future, would be a futile task, as nearly every concept proposed in this report, is also proposed in Agenda 21, and the report A Critical Analysis of Agenda 21 - United Nations Program of Action does a sufficient job of describing, and analyzing, those key concepts. It is important, though, to highlight certain excerpts, and details of the Brundtland report, that may help in providing a greater understanding of the overall Agenda. There were 21 members on this commission, all representing different countries, including such prominent figures as the previously mentioned former Prime Minister of Norway, Gro Harlem Brundtland, former EPA administrator and FBI director, William Ruckelshaus, and Canadian businessman Maurice Strong. Another notable member of the Commission, representing Guyana, is Shridath S. Ramphal, who is quoted in the children's version of Agenda 21 promoting population control, and criticizing anti-abortion groups like the Catholic Church. Separate, extensive studies should be conducted on the different members of the Commission, especially on Gro Brundtland and Maurice Strong, to find various interesting connections, but for the sake of brevity, we will move on from looking at the particular members of the commission. In order for the planners of this Agenda to achieve their ultimate goal, which includes having control over all of the land in the world, the power of eminent domain, or the power of government to take a person's private property, needs to used, and strengthened. The original Agenda 21 report mentions land collectivization, though the Brundtland report appears to focus a bit more on the topic, and the Brundtland report's recommendations on land collectivization deserve focus. As discussed in the analysis Go To Work and Give The Government Your Children: The Feminist UN Agenda 21 Plan To "Empower" Women, the United Nations is philosophically a collectivist organization, viewing the good of the community, over the desires of the individual. Various UN connections to Communists, and the representation of Communist ideals in UN literature, are also discussed in the analysis, and helps to explain the Agenda's ultimate goal of collectivizing land. Of course, one of the goals of Communism, as laid out in the Communist Manifesto, is to abolish all private property in land. "In centrally planned economies, the ability to plan and implement plans for urban development has been significant. The priority given to collective goods over private consumption may also have increased the resources available for urban development." "The redistribution of land is particularly important where large estates and vast numbers of the land-poor coexist." As detailed in the analysis Agenda 21: The Rockefellers Are Building Human Settlement Zones In Connecticut, moving people off of rural land, and into densely packed cities, is another aspect of this land collectivization scheme of Agenda 21. The Brundtland report suggests for governments to make it harder for people to obtain rural land, and says that "many governments maintain unrealistically low taxes on rural land." Thus, by increasing the cost of owning rural land, governments will discourage ownership, and occupation. Indoctrinating children, through "education", to be tolerant of growing up in densely populated communities is also recommended, as the report states "schooling should enhance the levels of tolerance and empathy required for living in a crowded world." A central theme of reports involving 'sustainable development' include the idea that the high standard of living of those people living in industrialized countries, is not only causing damage to the environment, but causes people living in the developing countries to remain poor. The planners use words like 'social equity' to give the impression that they want things to be more 'equal' in the world. Equality can be a tricky concept though. Equality can mean increasing the standard of living of the poorest countries to match the level in the industrialized countries, or it could mean dropping the standard of living of the industrialized countries down to the level of the poor countries. The UN Agenda 21 plan appears to favor the latter method. even a doubling of energy use bared on present mixes of primary sources...Any new era of economic growth must therefore be less energy intensive than growth in the past." Of course, most people will not voluntarily allow their standard of living to be lowered, and that is why the planners cannot be completely honest about what their true goals are. It is stated in the Brundtland report that when it comes to implementing sustainable development, "[w]e do not pretend that the process is easy or straightforward. Painful choices have to be made." Important to note is the use of the word 'straightforward', which, when defined, could mean 'going straight ahead', but it could also mean 'free from crookedness or deceit', and 'honest'. "It is doubtful whether such steady improvements can be maintained and extended if energy prices are held below the level needed to encourage the design and adoption of more energy-efficient homes, industrial processes, and transportation vehicles. The level required will vary greatly within and between countries, depending on a wide range of factors. But whatever it is, it should be maintained. In volatile energy markets, the question is how." The report goes on to give examples of how governments can artificially inflate the price of energy, which include increasing "domestic taxes" and "duties on imported electricity, fuel, and fuel products". "This enforcement of the 'common interest' did not necessarily impede growth and expansion though it may have limited the acceptance and diffusion of technical innovations." "In many cities, literally thousands of people already make a living sorting through wastes by hand on municipal tips. Investing in a more capital-intensive, automatic recycling plant could be doubly counterproductive if it unnecessarily consumes scarce capital or if a plant would destroy many people's livelihoods." The idea that technology can be a bad thing, because it takes away peoples jobs, can be a dangerous concept. Imagine that argument being used when something like construction equipment was first invented; "Don't use any excavators, you'll put the hundreds of men with shovels, out of work!" Technology can be highly beneficial by freeing people up to do other, more productive things, with their time. "However a nation proceeds towards the goals of sustainable development and lower fertility levels, the two are intimately linked and mutually reinforcing." are in harmony with the changing productive potential of the ecosystem." "One issue of relevance that requires further research is the use of the tax system as a means for controlling population growth and discouraging rural-urban migration. To slow down population growth, should families without children be given a tax incentive or tax break? Should a tax penalty be imposed for each child after a fixed number of children, considering that the tax system has not solved the population migration problem?" In this passage, Adedeji appears to be specifically speaking about suggestions for African countries, however, as quoted from the report, "...'sustainable development' becomes a goal not just for the 'developing' nations, but for industrial ones as well." An important connection to mention, when discussing the United Nations and population control, is billionare Ted Turner, and his highly influential support of the United Nations, which includes a donation of $1 billion dollars. Ted Turner is constantly promoting his belief that the world is over populated, and how drastic changes need to occur. One drastic change envisioned by Ted Turner is a global one-child policy. For a one-world government to truly work, and be legitimate, there can not be any smaller governments, or nation states, that claim to have sovereignty, or decision making power, over the world government. This is why the agenda is to remove any decision making authority that individuals have through their local, democratically-elected governments, and transfer that authority over to the non-elected bureaucrats at the world government of the United Nations. In the Brundtland report, it is described how global environmental issues cannot be effectively combated against if national governments are allowed to make their own decisions, and how these issues can only be addressed by a world government. "These challenges cut across the divides of national sovereignty, of limited strategies for economic gain, and of separated disciplines of science." these interlocked issues. Nor can nations, acting unilaterally." One last aspect of this report that deserves mention is the role that The Ford Foundation played in its creation. The report lists the Ford Foundation as a significant financial contributor, along with the John D. and Catherine T. MacArthur Foundation. The role that tax-free foundations have in the implementation of Agenda 21 are a constant theme throughout each aspect of the plan. A more intricate analysis, exploring the connections between the Ford Foundation, Agenda 21, and Connecticut, such as their association with the One Region Funders Group, is needed, and should be documented.